Many people have to deal with the problem of smelly feet or foot odor on a day to day basis. Foot odor is not only unpleasant but leads to serious hygiene issues as well which can be embarrassing at times. This problem is more common in people who wear shoes daily for longer durations of time. Climatic changes do have an effect on smelly feet, and the problem is not restricted to a particular gender, though it is more common in men. Most people describe it as ammonia, vinegar or a cheese-like smell that is primarily driven by sweat. Our feet have the highest concentration of sweat glands on the body and wearing socks & shoes on a daily basis traps all the sweat. Abundance of sweat coupled with warmth and moisture contribute to the growth of bacteria in the feet that causes pungent odor and production of odorous waste products such as Isovaleric acid, Methanethiol and Propanoic acid. Propanoic acid has a ‘sour and rancid’ smell while Isovaleric acid has a ‘cheesy and fermented’ odor. Fun Fact: Interestingly, sweat itself has no odor but the bacteria on the skin metabolize proteins and fatty acids that produce the odor which causes stinky feet. Bacteria: Out of the 2 to 5 million sweat glands present in human body, around 500,000 sweat glands are located in the feet itself. Sweat glands are of two types- apocrine and eccrine and the feet contain eccrine sweat glands which are responsible for thermos-regulation of the body. When the feet are enclosed within shoes and socks, these glands produce excessive sweat which leads to the growth of bacteria called Brevibacterium. These bacteria feed on dead skin and release a gas called methanethiol which has a sulfur like aroma similar to smell of some cheese or rotten cabbage. Propionibacterium is another bacteria present in the sebaceous sweat glands and has the ability to metabolize amino acids present in sweat into propionic acid, which has pungent vinegar like smell. Staphylococcus epidermidis bacteria thrive on human feet but can be found on any part of the body! They tend to interact with sweat to produce Isoveric acid—an established cause of cheesy or musty odor. Bacillus subtilis is responsible for the characteristic pungency of foot odor. However, the strongest bacteria of all is Kyetococcus sedentarius which affects almost 15% of the people and produces volatile sulfur compounds causing rotten eggs like smell in the feet. Skin Infection: Stinky feet can also be a result of certain skin infections like Keratolysis, which is basically caused by prolonged wearing of shoes. This infection is characterized by crater like depressions on the soles and toes and results in a sulfur like odor in the feet caused as a result of bacteria breaking down the skin. Also, it is not Athlete’s Foot that causes foot odor but a fungal infection usually contracted by walking barefoot on moist surfaces such as locker rooms or showers. Diet: This is often an overlooked part of dealing with body odor or feet odor in particular, because not many know that what we eat has a significant role to play in foot odor as well as bad breath. Our body releases sulfides and other compounds during the breaking down of food which are released in the form of sweat from our skin. Over consumption of food items having high sulfide content can lead to smelly feet. For instance, the people who have a low carbohydrate and high protein diet have a substance called Trimethylamine produced in their body for breaking down of proteins that leads to fishy odor. Seafood, red meat, garlic, cabbage, spices, onion and asparagus are the foods commonly associated with odor. Apart from these, hormonal changes, excessive stress and a condition called Hyperhidrosis (which causes one to sweat more than usual) can also lead to stinky feet. Did you know? Your feet represent your overall health, especially when you are ill. Hairless toes might be due to poor blood circulation. Toenail indentations also indicate an underlying infection. 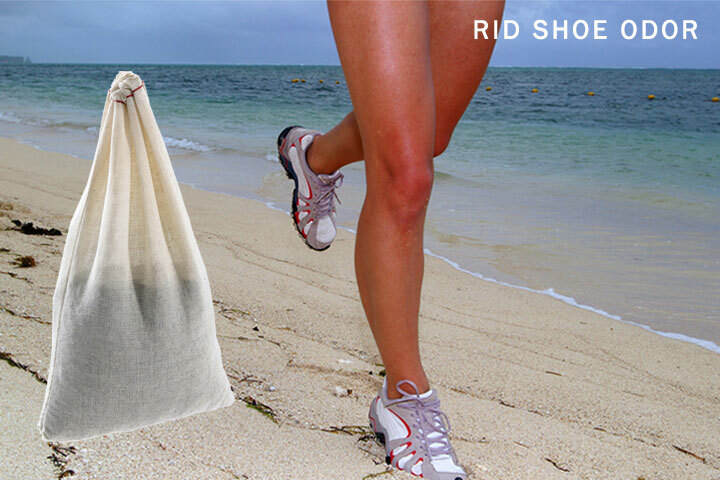 Ensuring Proper Hygiene: this is the first step towards eliminating foot odor. Washing and cleaning the feet with an antibacterial soap on a regular basis is a good idea as it kills most bacteria on the surface of the foot and minimizes sweat to a certain extent. Remove dead skin on feet with pumice stone as dead skin serves as food for bacteria and getting rid of it will greatly help you in dealing with smelly feet. Good hygiene reduces the chance of skin infections and other build up on the foot. Whenever you scrub your feet, it is best that you scrub it like a surgeon; soak them in black tea, Epsom salt or Listerine for at least 10 to 15 minutes and dry them well using a fresh towel. Pay Attention to Your Footwear: try to wear shoes that provide a certain amount of ventilation to reduce sweating. Open toed footwear or sandals allow the feet to breath and are generally recommended to people who sweat a lot. If you are wearing boots or shoes, try loosening the laces or remove the shoes for a certain period to reduce sweating. Wear socks made of alpaca, silk, acrylic and nylon. Eat a Balanced Diet: maintain a balance in your diet and eliminate the amount of sulfides and other odor compounds to reduce both feet and body odor. Also, deficiency of zinc in the body leads to feet odor, so try taking multivitamin tablets having a high zinc content. Use Foot Odor Eliminating Chemicals and Sprays: Astringents and Chlorophyllin are widely used for getting rid of foot odor as these two help in binding sulfides and neutralize them before they are released from the skin. Medicated powders and antiperspirants can also be applied on the feet, especially at night, so that they can act upon your feet throughout the night. Zinc sulphate creams have antibacterial action and can help you keep foot odor at bay for long hours. Along with the preventative steps outlined above, you can always opt for simpler natural but effective specialized products like Smelleze™ Reusable Sneaker, Shoe & Boot Deodorizer Pouches and Smelleze™ Natural Sneaker, Shoe & Boot Deodorizer Powder that are proven for treating smelly shoes. You can find an array of eco-smart odor removal products at NoOdor.com.